The Spider-Man: Into the Spider-verse story is amazing and the animation is breathtaking. Check out my review below and keep reading to enter for a chance to win a DVD prize pack! This post contains affiliate links. Post and giveaway are sponsored by Sony Pictures. All opinions are my own. From the moment I saw the trailer for Spider-Man: Into the Spider-Verse, I knew I would love the movie. Everything about it looked like 100% Marvel fun and you know I am here for that. But as things go and life got busy, we didn’t get to the theater for this one. We kept planning on it and then another weekend would pass and we just couldn’t find the time to get there. So as soon it was released on digital I bought a copy and now that we’ve seen it, I can finally say I’m obsessed with this Oscar-winning movie! It’s pure Marvel magic and totally worth the wait. Don’t even get me started on the soundtrack! I’m not even kidding when I say I’ve been playing the music from the movie on repeat for the past month (even when my kids are off to school) without shame. It’s that good! If you haven’t had the chance to see it, it’s still well worth your time! The animation is amazing as you’ve probably heard, but the story is just as good and plot-filled as any other standalone Marvel movie. My whole family loved it and my boys have already re-watched it many times over. SPIDER-MAN: INTO THE SPIDER-VERSE introduces Brooklyn teen Miles Morales, and the limitless possibilities of the Spider-Verse, where more than one can wear the iconic mask. 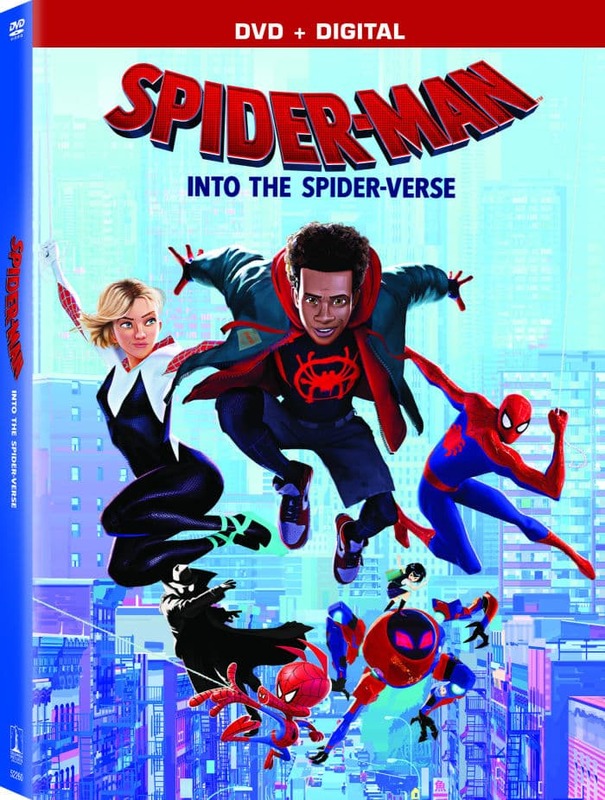 During the movie, we get to know Miles Morales and his family along with alternate-universe superheroes who are either lovable, hilarious, smart or all of the above as they work together to right the wrongs in the Spider-Verse. This movie was moving, entertaining, visually and audibly stunning and heartwarming all at the same time. And the Stan Lee cameo was probably my favorite in all the Marvel movies to date. I seriously can’t recommend it enough. Spider-Man: Into the Spider-Verse really is for anyone and that’s what makes it so fun! You can be serious or silly or a boy or a girl and still wear the mask. I think that’s a huge part of the appeal on top of the quality. I am here for all the Stan Lee clips you guys. Every last one. And I dare you to get the song, Sunflower out of your head. It’s so catchy!! Want your own copy? 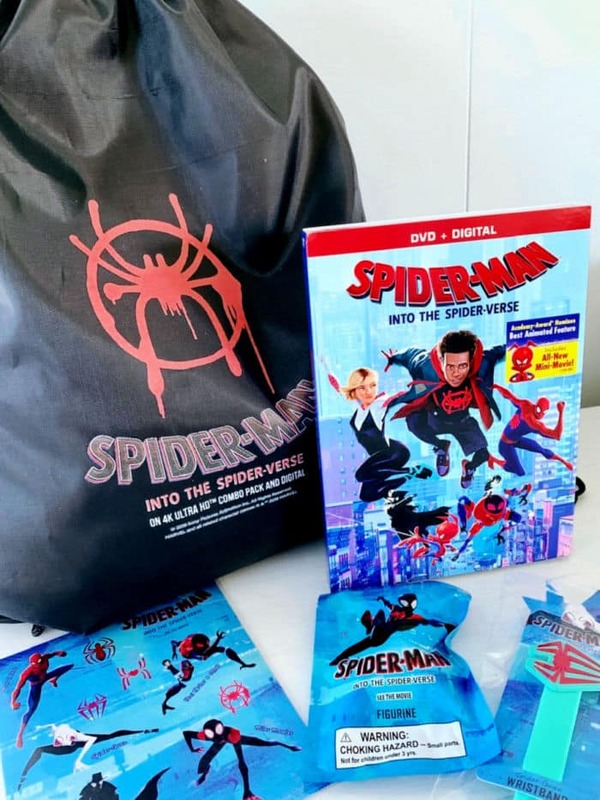 Don’t miss your chance to enter our Spider-Man: Into the Spider-Verse prize pack giveaway! 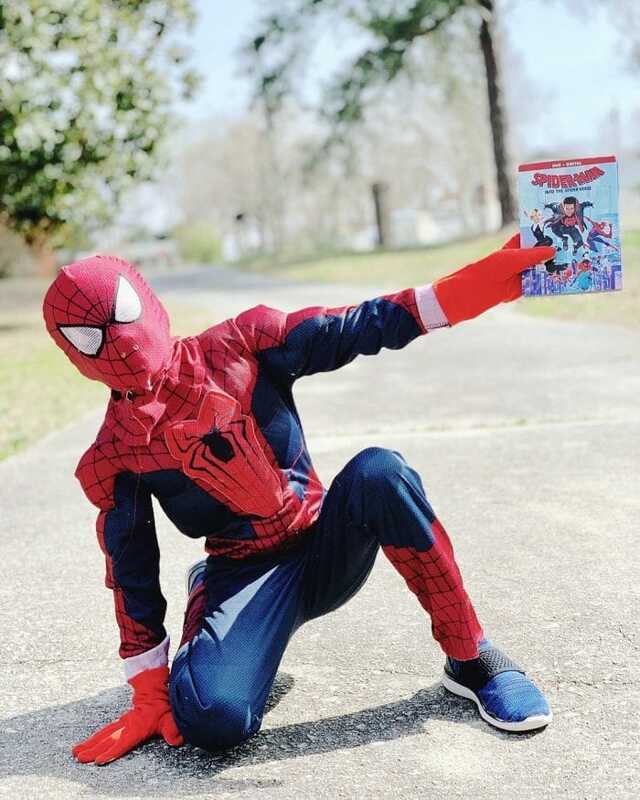 One reader will win a Spider-Man: Into the Spider-Verse DVD, cinch sak, branded figurine (actual prize will be a random character), sticker sheet, and themed wristband (actual prize will be a random character). To Enter, please be sure to follow the Rafflecopter instructions below! GIveaway rules – One winner will be randomly selected and emailed to claim the prize. Giveaway ends at 12:00am ET on 4/3/2019. US entries, age 18 and older only please. Please respond within 48 hours to claim your prize. Good luck! I am here for this!!! I saw it, I liked the older Peter Parker. I have not seen the movie, but I like Peter Parker. No, I haven’t seen the movie yet. This is the best Spider-Man movie ever! And I don’t say that lightly! I have not seen the movie yet but I can’t wait to see Peter Porker/Spider Ham. Unfortunately we couldn’t watch it in theaters but my kids are so excited about watching it at home with homemade popcorn, cozy blankets and sweets. So crossing my fingers we win it! My son would love it if I won this! He hasn’t seen it, but he would love to. I have not seen this yet. my son wants to see it. I like Peter parker. We have seen it and love it! I can’t wait to watch it again now that it is out on DVD! My favorite character is Gwen and my son’s favorite is Miles! I have not seen this yet, but have heard it is really good. My favorite characters are Peter Parker and Spider-Ham. 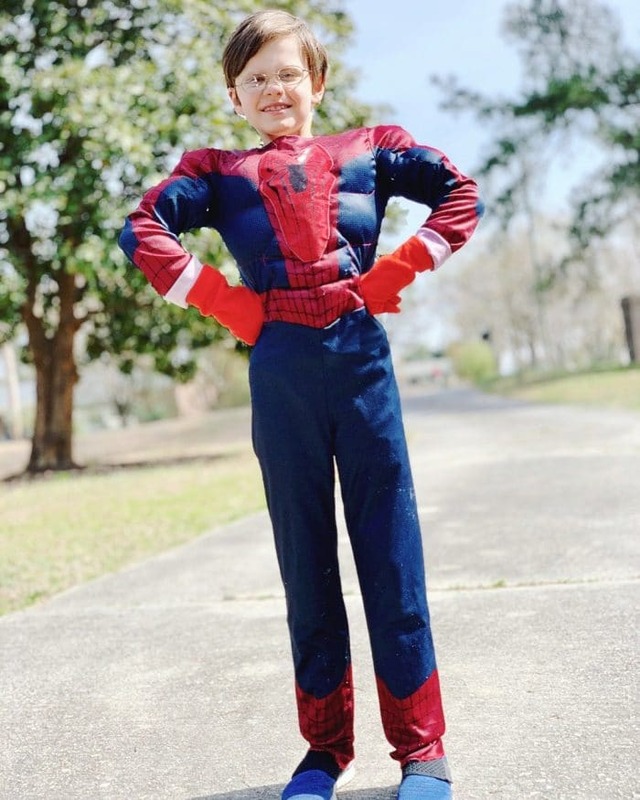 I have not seen the movie nor do I have a favorite – My grandkids love spiderman everything and so I will enjoy their many adventures. We love Spiderman but have not seen this yet. I have not seen this yet. My nephew would love to see this if he hasn’t already. I have not. I love spider man! And I haven’t seen the movie yet, just heard a lot about it! I have not seen it. My little boy wants to see it really bad. No we have not! My boys want to see it so bad, as do my husband and I! I have seen the film and my favorite character is Miles. I haven’t seen it and am not sure of my favorite character. I have not seen this, yet. I like Gwen Stacy. I haven’t seen it but wanted to but none of my kids did! I keep hearing it is truly awesome! I haven’t seen it yet..but we really want to.. I have no clue who my fave is. I have not seen it yet, but I am sure I will because my granddaughter loves Spiderman. Have not seen this yet, my sons are looking forward to seeing it. I have not seen the movie yet but would love to. I have though heard a lot about Spider Gwen. Yes, I have seen Spider-Verse. I like Peni. I haven’t seen Spider-Man: Into the Spider-Verse yet.